Neither the “Boys”, Mick, Peter and Larry, or I have ever experienced a walk with so much mud. 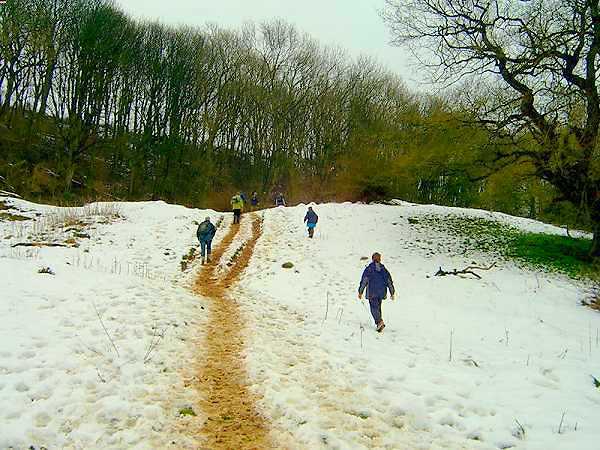 At least 50% of the 15 mile plus route can best be described as a quagmire, which I suppose was inevitable after the snow and generally wet weather that this area had experienced during the days leading up to the walk. And to be fair the organizers in their information had warned everyone that mud could be expected. They were not wrong. Waiting for the start of the "Challenge". 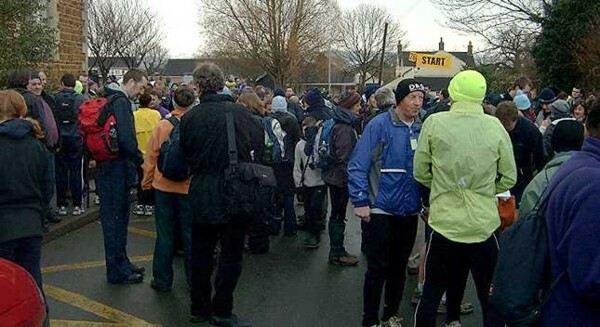 Larry and I had motored to Harby with Mick, where we met Peter and soon were congregating with almost 1000 other runners and walkers outside the local school in readiness for the 9 o’clock start. Fortunately we were at the front of the start lineup and so were in a good position when the 15 mile jaunt started. 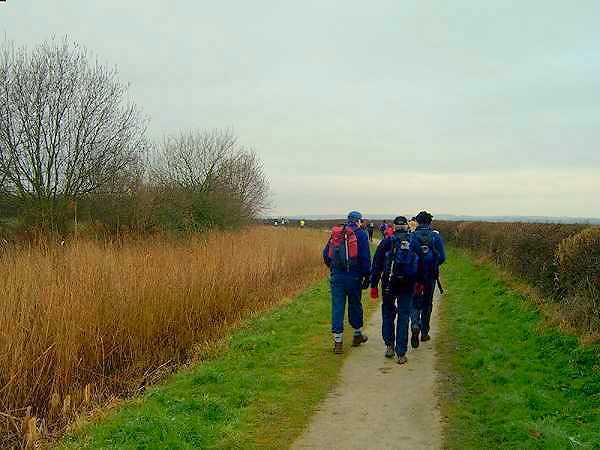 However, runners quickly passed us and, by the time we reached the canal towpath to the north of Harby, they were vanishing into the distance and the walkers were beginning to spread out. Walkers starting to spread out as they join the Canal. 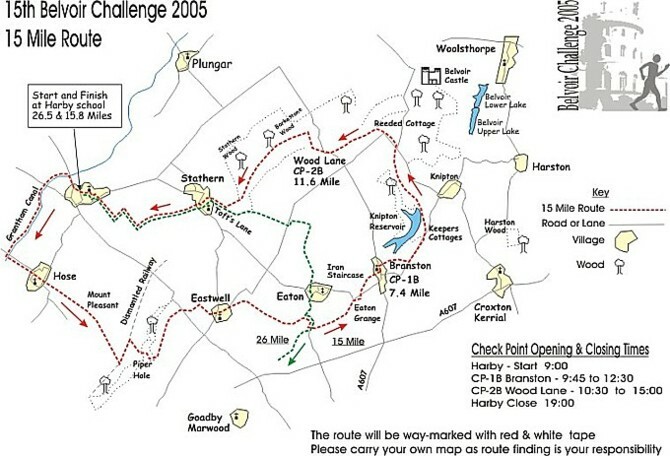 To see a copy of the route, kindly provided by the Belvoir Challenge Walk Organisers, then Click Map Image. With Peter and Mick in front we were going at a cracking pace but even then I knew that I was unlikely to be able to keep this up when more difficult terrain, namely ascents, were reached. 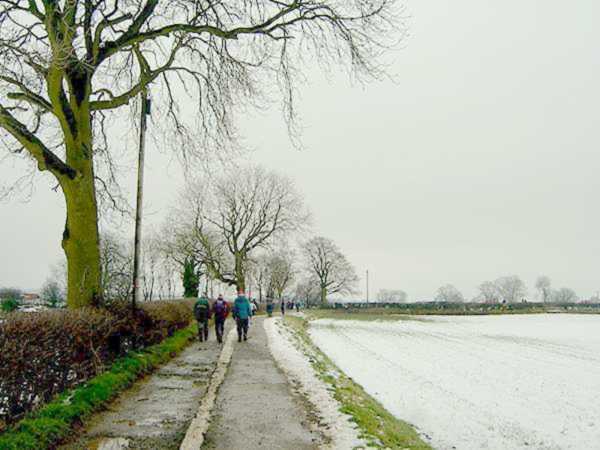 As we walked along the canal I could see to the south east the snow covered Harby Hills, which I thought might cause a few problems, but as the tow path surface was very good I was not expecting the mud that lay ahead. Leaving the canal we followed the road through the village of Hose and were soon crossing field paths to the “Hills”. By now I was trailing the “Boys” by about 100 yards and the gap was getting bigger. I was strolling along talking to another walker and knowing that I would be happier to walk at my own pace than their speed they were soon vanishing from view. Easy walking along the dry tow path, but the snow on the hills looks menacing. With regard to this it is worth noting the words of Robert Lewis Stevenson from Walking Tours. 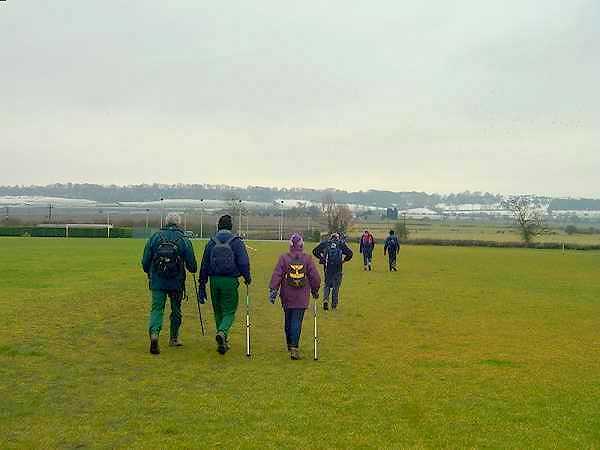 A walking tour should be gone upon alone, because freedom is the essence; because you should be able to stop and go on ...and because you must have your own pace, and neither trot alongside a champion walker, nor mince in time with a girl. So I didn’t need to trot, and the “Boys” were saved the embarrassment of “mincing”. Although mud had already been experienced, on reaching the dismantled railway below “the Hills” I was amazed at what lay ahead. The whole path was covered by a thick layer of mud. The only good thing was it was not heavy, but of a slurping variety, so when you placed your foot in it rather than bringing out a boot heavy with mud you were more likely to have a problem retrieving your foot from the clinging and sucking slurry. At times the mud just didn’t seem to want to release your footwear. 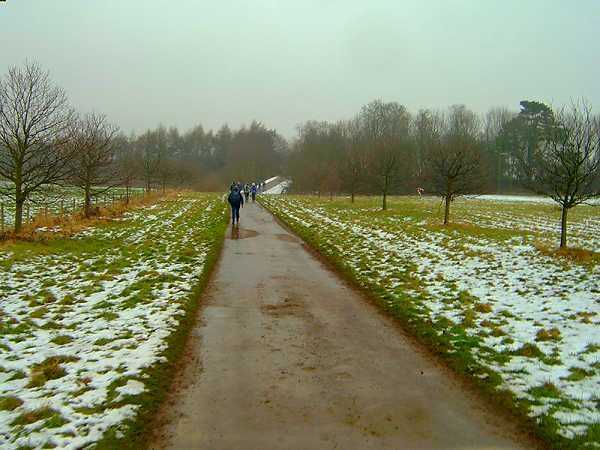 It was such a relief to leave this track, but on turning right (south east) and starting uphill the surface got no better but, like the other walkers, I laboured on tramping through a mixture of mud and snow until the top of the hill was reached. 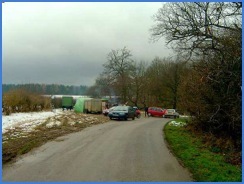 What a relief, particularly when, just before the road between Waltham and Harby, the route became a tarmac track. 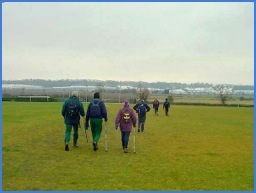 After the road was crossed, the terrain was still very muddy on tracks to Eastwell. 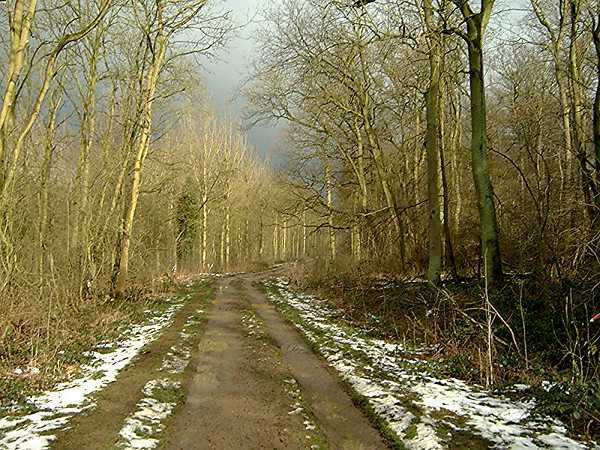 It was on this track when I stopped to secure my right boot that it then started to rain so, on reaching Eastwell, I took advantage of a bus shelter to put on my waterproof coat – I already had over-trousers on. The mud continued as we left the hard surface of the road in Eastwell, but by now I was so muddy I, like I suppose most walkers, ignored it. 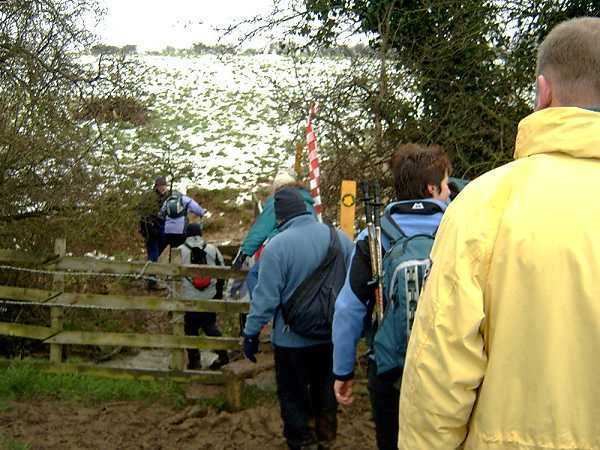 It would be difficult to get much muddier, so everyone ploughed on, only stopping to queue to cross various stiles on route. South of Eaton we crossed the 26 mile route – was I glad I wasn’t attempting that. 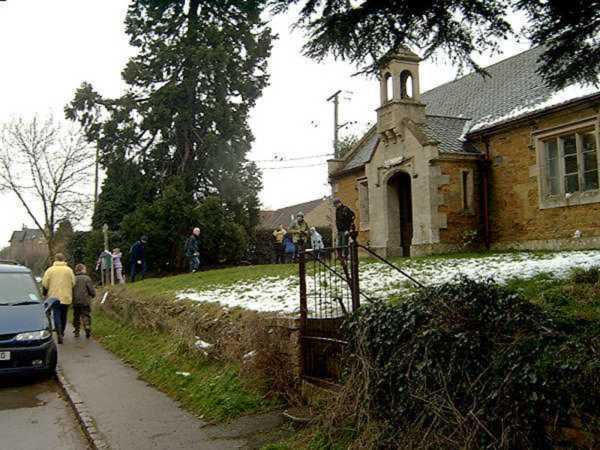 The next main reference point was the Iron Staircase, located approximately ¼ mile outside Branston. On reaching it, it was quickly ascended and 5 minutes later at 11.55 a.m. I walked into the first check point. According to the route details this was 7.4 miles from the start and, although I had hoped to reach it by 11.30 a.m, in view of the conditions I was very pleased with my time. 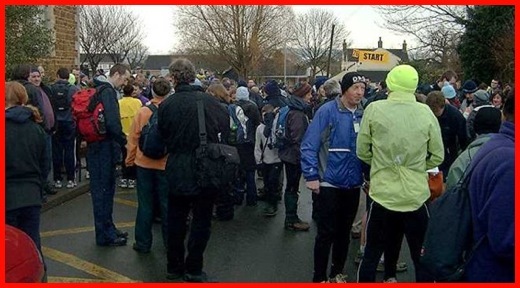 However, it should be noted that many walkers considered this distance to be incorrect. It would seem that last minute changes to the route were not reflected in this detail. 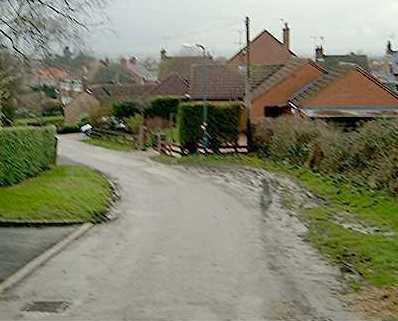 Having measured this part of the route on a map and from comments by others it would seem the distance to Branston was more like 9 miles. Or was it the mud that made it seem longer? 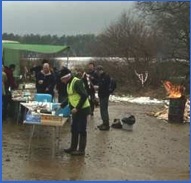 Although a number of people had passed me during the later stages of this first leg of the walk, when I reached the check point many of them were still there enjoying the wonderful refreshments that had been provided and were still enjoying them when I left after a bite to eat and a quick intake of liquids. 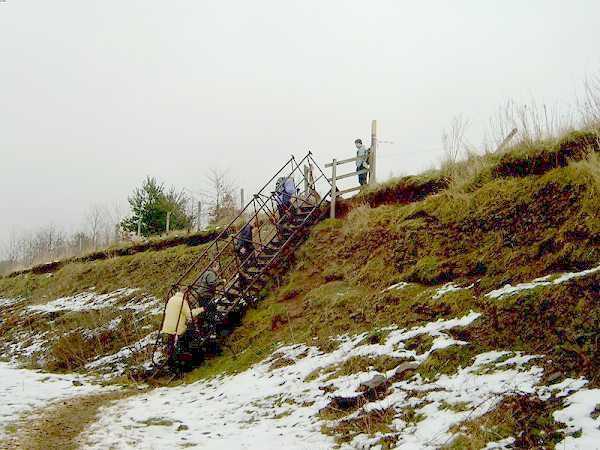 I don’t like to waste too much time at check points.Climbing up the steep and muddy embankment. Soon I was going downhill, through a field and across a fast flowing stream and then it was uphill. 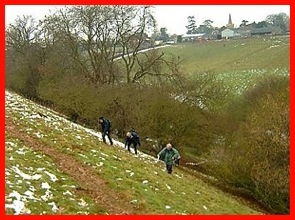 A real tricky ascent up an embankment. This would have been difficult in dry weather but on a day like today it was horrendous. I was so glad I had a walking pole with me to assist with this tricky slippy climb and was very relieved to reach the top. I don’t think any of the walkers/runners who did this route are likely to forget this part. 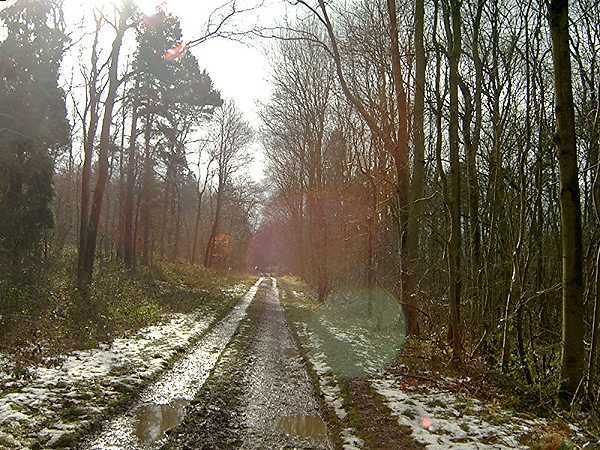 After reaching the top, more mud was negotiated before reaching the road that went towards Belvoir Castle. Walking became easier and even when we left the road and walked around the north east side of Knipton Reservoir it wasn’t too bad. 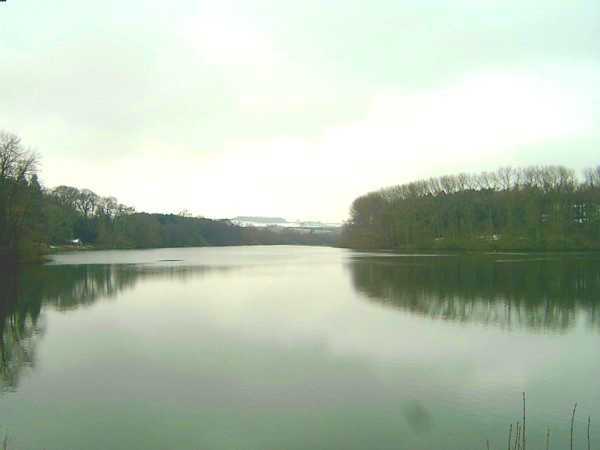 However, having crossed the sluice at the end of the reservoir the route became muddy again and there was a long, long uphill grind before the route rejoined and crossed the Belvoir Road and entered woodland. Initially the track we followed was very tricky, but did get marginally easier in parts as it progressed through Terrace Hills. I think at this point I should explain that when I say it got easier it means that I was less fearful of doing a slide in the mud and landing on my back. 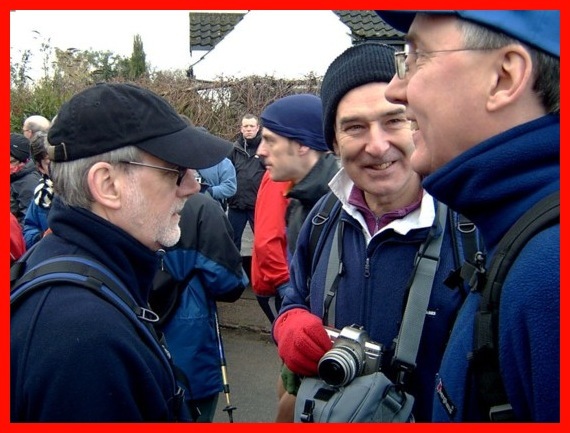 When I spoke to Larry, Mick and Peter at the end of the walk, they like me recounted how they had some narrow escapes. Along this part of the route I was conscious of the Belvoir Valley that could be glimpsed through the trees on my right but, I suppose, like most people taking part in the challenge most of the day was spent looking where you put your feet and “admiring” the various qualities and textures of the mud. Out of the woods and at 1.10 p.m. I walked into the second check point. 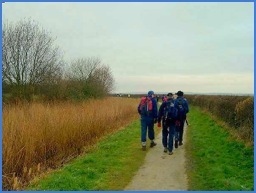 It had taken 1 hour and 10 minutes since leaving the Branston, a distance according to the route info of 4.2 miles. Was it really that far? I really didn’t think I was walking that fast. How can I be so sure about the times? When I take a photograph, like most digital cameras, the time and date are recorded. Very useful. More food and drink was enjoyed at this check point and, with a piece of fruitcake in my hand, I continued on my way into Barkestone, Plungar and Stathern Woods. 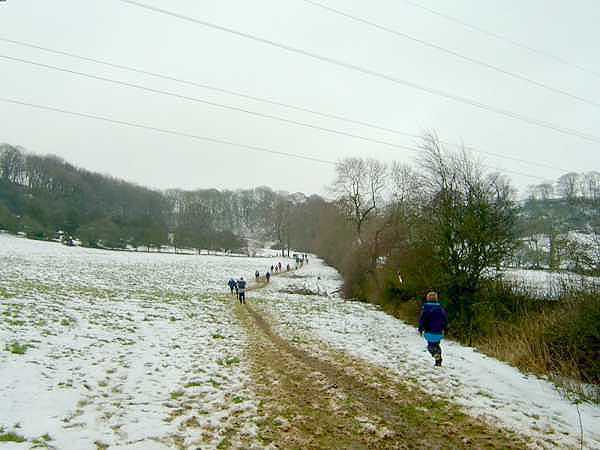 Now I had thought the conditions prior to this had been bad but the track we followed into Barkestone Wood was horrendous. At the top of a downward slope I had my nearest near miss of the walk. How I managed to regain balance having done a sort of 2 foot slide forward, a lean back, a leanMud. Mud. Lots and lots of Mud. forward, a slight jig and a stop will be long remembered and puzzled over. 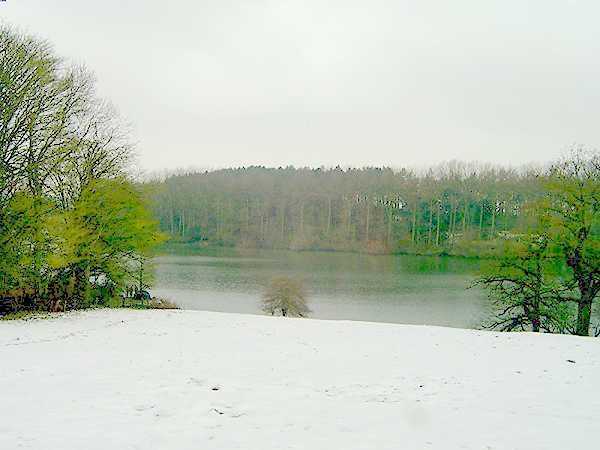 The downward slope of this part of the walk would have been easier done on skis, and I don’t ski, so I followed some foot prints through the trees to the left and reached the bottom of the slope without further gymnastics. The route then went left. For approximately a mile there was an almost straight uphill grind. Here the track, which was obviously used by vehicles, had the ever present mud and some large puddles where wheels had been. The base of these puddles was usually firm so this was the favoured part of the track, but I had to be aware of hidden potholes so the walking pole was well used to check out puddle depths. About a ¼ mile ahead I could see a lone walker and soon one appeared about the same distance behind me. These two helped to spur me on. Could I catch the one in front up before the one behind caught me? During this part of the walk the weather was really good with the sun shining through the trees. I was almost tempted to take my waterproof coat off but in view of what happened 40 minutes later I’m glad I didn’t. 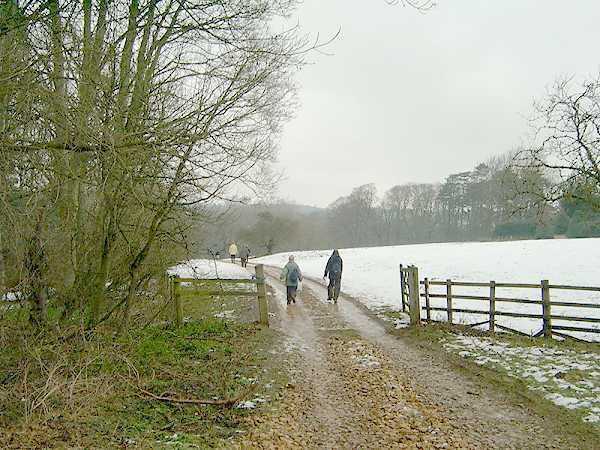 It was a relief to leave the woods behind, but negotiating the next part of the route across a very muddy downward sloping field into Stathern was certainly no picnic. What a relief to hit the hard tarmac of the Stathern Roads. As I neared the Red Lion Pub I contacted Larry on his mobile telephone to check if he had succumbed to alcoholic refreshments and ventured into the pub. Although he had been tempted he had shown admirable resistance and was now fast approaching the end of the walk. We estimated he, Mick and Peter were between 30 and 40 minutes ahead of me. By now I had caught up with the lone walker who was in front of me on the track through the woods and we walked together for a short time. The end was now nearly in sight when we were hit by a rainstorm. 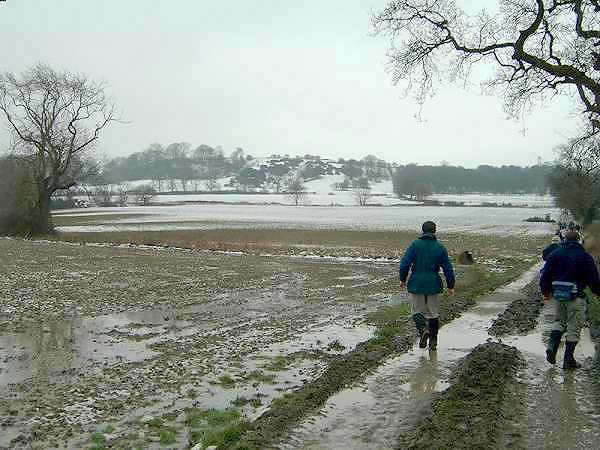 The rain and the muddy terrain seemed to slow me down more than him and soon he left me behind. About 15 minutes later I walked into the Harby School and was given a time of 5 hours 37 minutes. I was very pleased with this. I would have been happy with such a time in less horrendous (muddy) conditions. Throughout the walk various walkers I had spoken to considered that the distances were not as stated. The official distance being 15.8 miles, but some competitors with GPS’s measured it at a fraction over 17 miles. 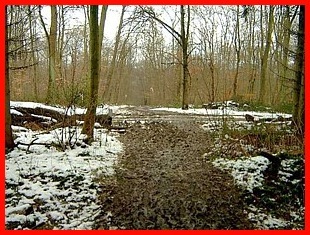 However, whatever the distance it was a very muddy walk. And I really enjoyed it. It was well organized, the food was excellent and way marking was magnificent. At every twist and turn there was red and white tape to indicate the way ahead. 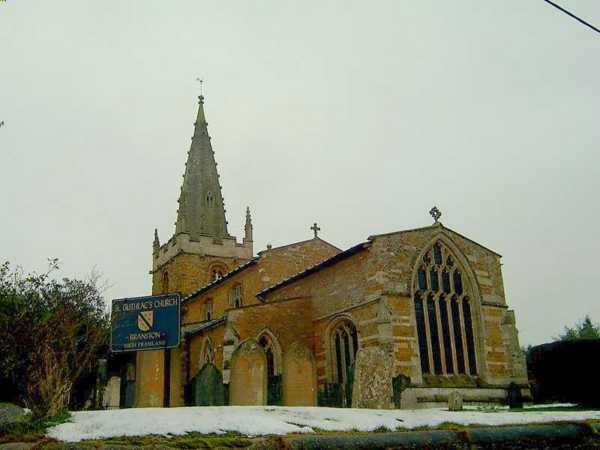 So having enjoyed my soup and pudding (compliments to the chef) we four bid farewell to Harby and headed for a pub in Waltham on the Wolds to swap experiences and enjoy a pint. A pleasant end to a muddy experience. 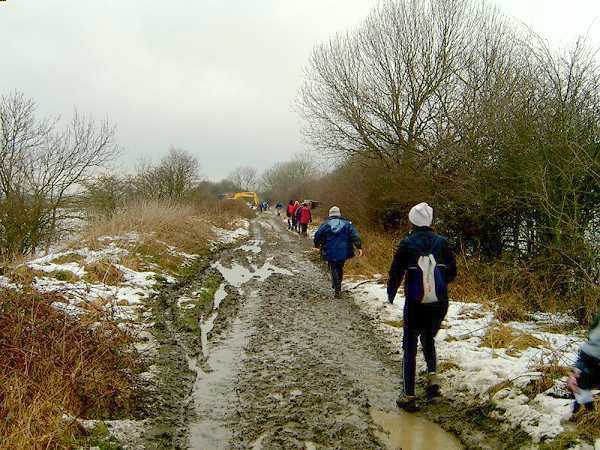 Since writing this I have been informed by Helen and Tony, two of the walk organizers, that the course was altered as some of the original route was even muddier!! 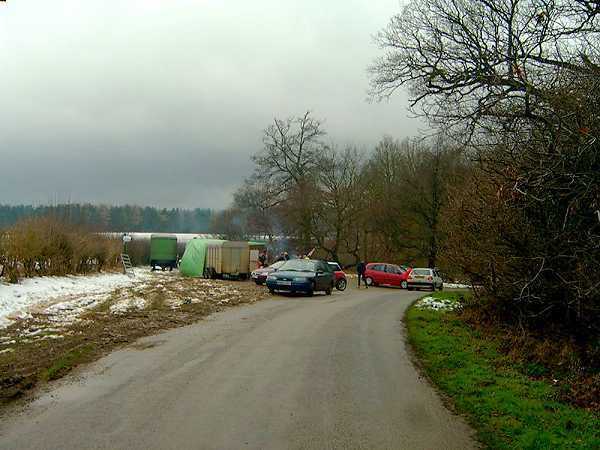 The event, however, was a big success and, although it was anticipated that there would be many retirements because of the conditions, there were considerably less than expected.